Monday UPDATE UPDATE: Final figures are in, Riddick with a slight uptick, sneaking past the $19M mark. Sunday UPDATE: Empty seats were aplenty this weekend at the cineplex. In the weakest weekend of 2013, receipts for the top 10 flicks totaled just $62.5M, some $4M less than World War Z debuted with in mid-June. Riddick took the title, though the threequel finished on the low end of expectations, shoving The Butler to the back seat after a three-week run at number one. 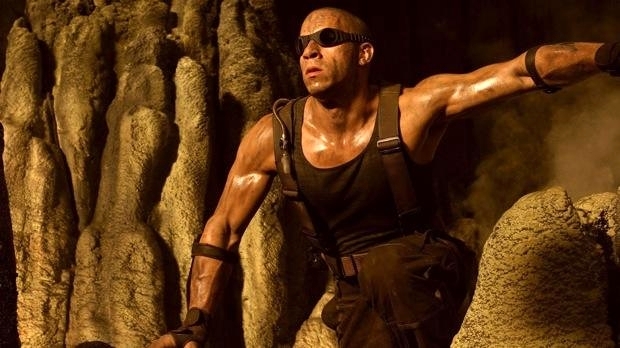 Oiled-up and plenty swoll for his third outing as a sunlight-sensitive, humanoid-killing, quasi-moral thug, Vin Diesel lords over the cineplex this weekend as his Riddick is the lone new offering — thanks NFL. With America turning its collective attention to football – and kids' fall sports activities – Hollywood enters its second true "dead zone" of the year, the first since January/February. Going back to 2010, just seven films have debuted with more than $20M in the month of September. 1. Riddick $20.5M (↔) - It's been nine years since Riddick's last outing, do sci-fans still have a shred of interest in the series? 2. The Butler $12.5M - Minimal weekend-to-weekend drops for the first lock to nab an Oscar Best Picture nomination. $82M banked and counting. 3. We're the Millers $9.25M - Crossed the $100M mark last Friday, Jennifer Aniston's sixth $100M+ flick. 4. Instructions Not Included $7.25M - Became the biggest Spanish-language debut ever last weekend as Lionsgate widens the comedy's release to 700+ theaters. 5. One Direction: This Is Us $6M - As concert-movie success stories go, sandwiched between Katy Perry and Bieber.